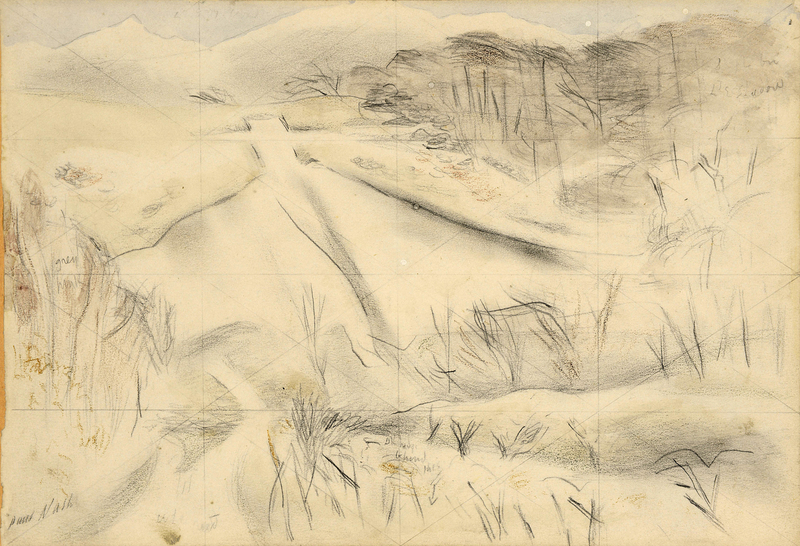 Tate Britain is presenting a major exhibition of the work of Paul Nash, starting on October 26th 2016. “Uncover the surreal and mystical side of English landscapes through one of the most distinctive British painters… Featuring a lifetime’s work from his earliest drawings through to his iconic Second World War paintings, this exhibition reveals Nash’s importance to British modern art in the most significant show of his work for a generation”. Tate Britain. We will be taking a number of works by Nash to Olympia Art Fair including one of the original watercolour studies (above) for the oil painting ‘Whiteleaf Cross’, painted in 1931, which is in the Whitworth Art Gallery, Manchester. Whiteleaf Cross is a chalk hill carving in the shape of a cross in the Chiltern Hills, Buckinghamshire. As such it was a perfect subject for Nash, who used the landscape repeatedly as a metaphor for the War and its devastating effect on humanity. A larger and more finished watercolour of the same subject sold at Christie’s in June 2007 to the Buckinghamshire County Museum.